I was back at all too familiar Crewe Station on Wednesday to travel down to London. The train was on time but someone was sitting in my seat in the quiet coach. He moved and I got my window seat and phone-charging socket, which was needed. The not-so-quiet coach was soon subject to the debate of a family from Liverpool as to whether or not Suarez should be asked to leave Liverpool FC following his biting episode in the world cup. I read my Trail magazine and wished I could be out on the hills. Once we had arrived in Euston, I walked out in bright sunshine and did a few bits and pieces en route to the Royal Society of Medicine where I was staying for that night. All around the sales were in full swing but despite having been known never to miss a shopping opportunity in the past, I now feel curiously detached from it all and am trying to declutter. After a rest and an e-mail catch up in the RSM I sauntered over to John Lewis to have my dinner and a view of the rooftops. After that I read and had a fairly early night as the TV choice seemed to be either football or endless debate about the phone-hacking scandal. I was up early for breakfast and out soon after to walk to the Barbican where I was attending a conference. I have been past it before but never been in it. It is a complete rabbit warren and I spent most of the day in windowless auditoria on the fourth floor or down in the underground rooms. The sessions were interesting, I caught up with several colleagues and had to chair my special interest group AGM at lunchtime. By 4pm I needed to be outside and left to wander back toward Euston. I enjoyed pottering along through Clerkenwell and Bloomsbury, admiring interesting buildings and shops. 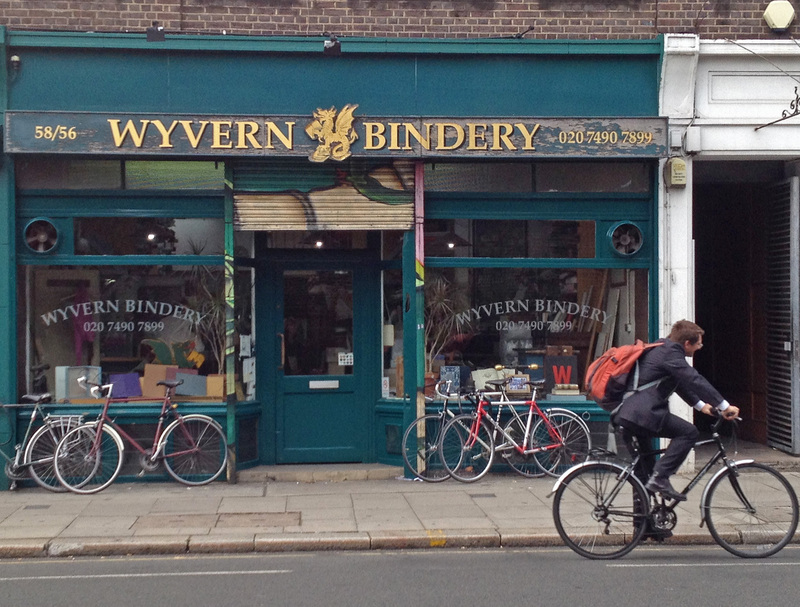 A bindery caught my eye as I have occasionally bought books just for the cover or binding and fancy doing a bit of bookbinding myself. In Skoob books, one of my favourite secondhand bookshops in this part of the world I found John Muir’s eight wilderness books in one volume. I think I have read some of them about 30 years ago but having now been to the Sierra, I must read them again. My backpack is now even heavier so looking forward to getting home later this evening.